You are here: Australian Herbicide Resistance Initiative › News › Microbial degradation of propyzamide – will we have a problem? Sometimes we worry about things that might happen in the future, and it never happens, like the millennium bug. The anti-climax was overwhelming. We also thought that daylight savings would fade our curtains, but lo and behold, no problems there either. Other times we worry about things that might happen, like Trump being voted in, and it does actually happen. Should we be worried about enhanced microbial degradation of propyzamide bringing about the downfall of this excellent herbicide? Four years without carbetamide returned soil bacteria levels to similar levels to untreated soil. Any evidence of enhanced degradation of propyzamide that persists from one year to the next. Could it happen? Sure. Are there things that we can do to minimise the risk? Yes. The pasture seed industry of south-eastern South Australia is a melting pot of herbicide resistant weeds. Pasture seed is grown in the same field for many consecutive years, often with the same herbicide treatment every year. It’s a place where herbicides cop a hammering and many unique cases of herbicide resistance are found as a result. 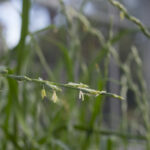 When a pasture seed grower contacted Steve Powles in the early 1990’s to tell him that carbetamide had failed to kill ryegrass, Steve naturally suspected that resistance was at play. When he sampled seed from survivors and tested for resistance in the lab, he found only susceptible weeds. Why is it so? Stephen Hole then stepped up to the plate to investigate as a part of his PhD studies. Stephen compared carbetamide efficacy at two fields. Field A – no prior history of carbetamide application. Sandy clay loam pH 4.8. 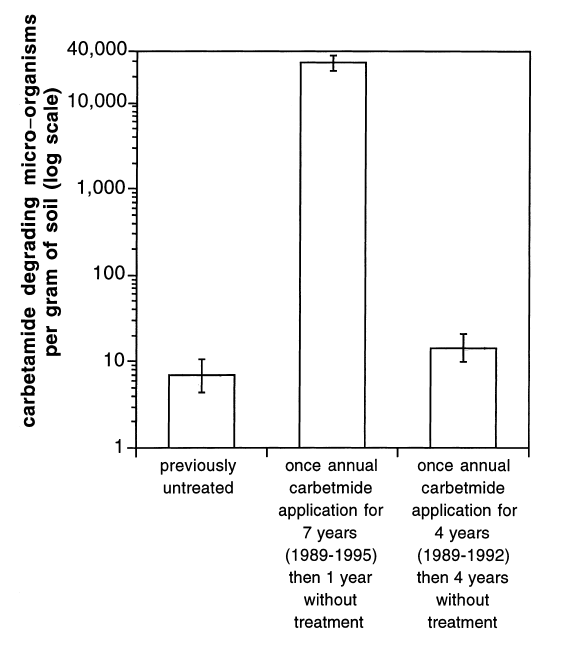 Field B – Carbetamide applied commercially for three consecutive years (1990-92). Sandy loam pH 4.9. In 1993 he compared a single application of carbetamide and two applications of carbetamide 103 days apart (carbetamide pre-treatment). Carbetamide as a single application achieved 88-89% control of ryegrass in both fields A and B. Field B had been treated with carbetamide for three consecutive years leading up to this research and this appears to have had no effect on enhanced microbial degradation. One application of Carbetamide in June of 1993 was enough to cause significant enhanced degradation of carbetamide that was applied 103 days later, even in field A where there was no history of carbetamide use. This field research confirms that propyzamide is also prone to enhanced microbial degradation. Applying propyzamide twice in the same season, 77 days apart, led to a significant reduction in control of ryegrass with the second application. While propyzamide and carbetamide are similar herbicides it seems that they are very different in the eyes of the degrading bacteria. 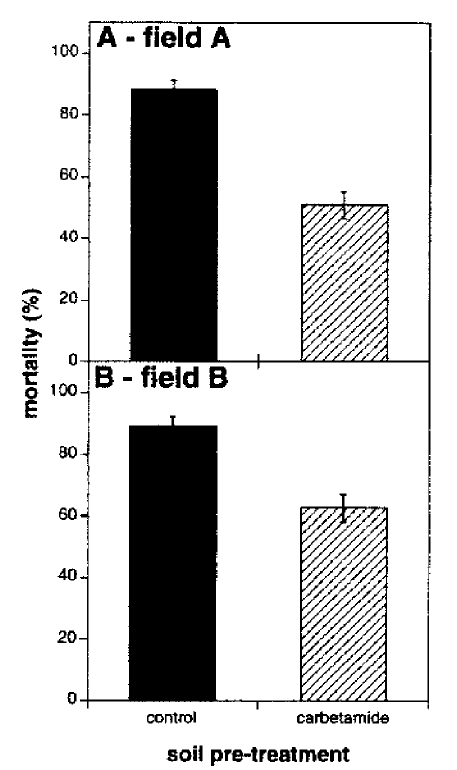 Pre-treatment with one herbicide did not reduce the efficacy of the other. Applying carbetamide every year for five to seven years reduced the half-life of the herbicide in the soil from approximately 30 days to four days. In this study, the last carbetamide application was made 12 months before sampling, so this proves that the soil bacteria levels required to rapidly degrade carbetamide can persist for at least 12 months in the soil. The good news is that where the soil was left untreated for three to four years, the enhanced degradation effect appears to ‘wear off’ and the half-life of carbetamide appeared to revert towards more normal levels. Further measurement of the number of carbetamide degrading bacteria numbers supported the half-life measurement. 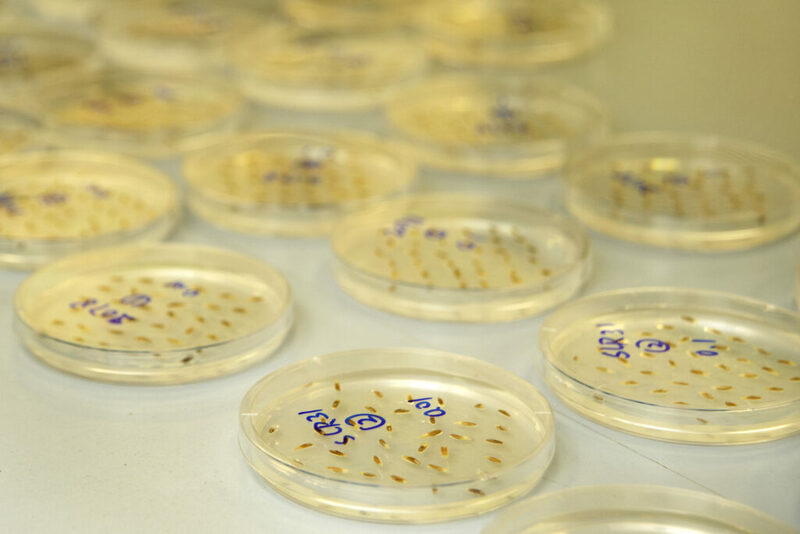 The control plots had just seven carbetamide degrading organisms/gram of soil compared to 29,000 / gram of soil where carbetamide had been applied for seven consecutive years leading up to sampling. Where carbetamide was applied for four years then no applications were made for the following four years there were just 14 carbetamide degrading organisms/gram of soil. 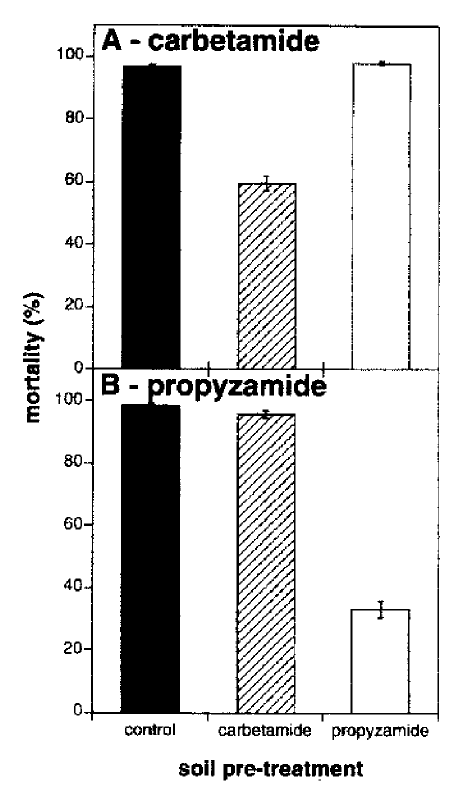 In some other unpublished work, Steve Powles visited a golf course in Victoria where propyzamide had failed. He managed to show that there was enhanced biodegradation of propyzamide which was responsible for the herbicide failure. Steve Powles has also recently checked a couple of paddocks from Kojonup with propyzamide history and in which propyzamide efficacy was only so-so. He didn’t find enhanced biodegradation. Thus far, no one in Australia has observed enhanced propyzamide biodegradation from its current use patterns in canola. There is evidence that propyzamide is prone to enhanced microbial degradation, but at this stage there we haven’t seen this persisting from one growing season to the next in broad-acre cropping. The only evidence we have at this stage is where two applications were made within the same growing season. However, we have seen that carbetamide degrading bacteria can last from one season to the next, and there is no reason that this could not be the case for propyzamide degrading bacteria. What can we do to look after propyzamide? Avoiding applying propyzamide in consecutive seasons is a good start. How many years should we leave between propyzamide applications is really anyone’s guess. Common sense would say that the more that we can spread it out in the rotation the better. A three to four-year break between applications would be great (we must disclose that this is purely speculation), and this would slow the evolution of resistance to this herbicide at the same time. Should we be worried about enhanced microbial degradation of propyzamide? Yes. But if we do the right thing, and rotate to other herbicides, we can go a long way to looking after this herbicide for many years to come. P.S. Have you followed us on Twitter? Join the community today!